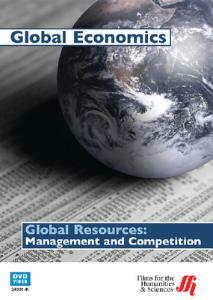 Explore economic questions surrounding the management of, and international competition for, natural resources. Describing the process by which nations translate the products of their forests, fields, mines, and waters into economic and political power, the video provides insight into the drive to control natural resources, the role they play in the economic development of poor countries, the precarious concept of the global commons, and the connection between resource mismanagement and environmental damage. Recent events in the Middle East, Asia, and Latin America highlight historical patterns of international resource exchange and exploitation. Duration: 39 minutes.